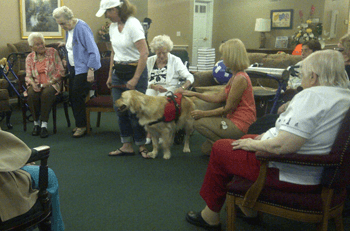 Therapy dog is term for any dog that helps bring happiness or comfort to another person. This dog does need special training to accomplish this. We can certainly assist in training your dog to make sure your dog has the necessary skills and training to be able to become a Therapy Dog. We do recommend that you read up on the AKC CGC requirements and get your dog to at least this level of training before you inquire at Nursing homes or schools or any where else you might want to share the love of your dog. Training can be at any age but the dog must be trained in Basic Obedience to qualify. We strongly recommend that Off Leash Obedience is completed before we can get into any specialty training. Training can be a long process and not every dog qualifies.